Capable of supporting up to 300kg, the Oliver James Portable Hammock is no joke when it comes to hammock strength. Made with the same materials as military parachutes, it’s ultra-lightweight and durable, and weighs less than 600g. We love the build quality of the Oliver James Portable Hammock. 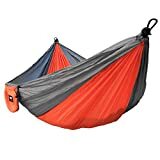 It’s constructed using military grade parachute material, that’s capable, along with the hooks and cords, of supporting up to 300kg of weight. Including as part of your long-term, advanced camping and hiking kit. Capable of supporting up to 300kg, the Oliver James Portable Hammock is no joke when it comes to hammock strength.